Tulips bulbs, like daffodils, announce that spring has arrived. Planting tulip bulbs is very easy, however caring for tulip plants can be a bit more challenging than growing daffodils, because tulip bulbs tend to be short-lived - if the deer, mice, and squirrels don't eat them first. But even if you have to grow your tulips as annual plants, they will still lift your spirits in the spring. Tulips have had a fascinating history. Although closely associated with Holland, tulips were first cultivated in Turkey. 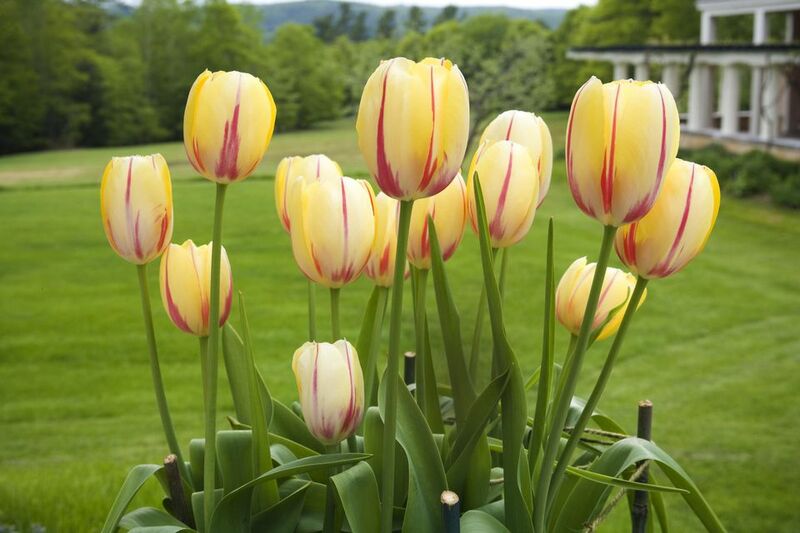 The name tulip is believed to be derived from the Turkish word for turbans, "tulbend," because of their resemblance. They gained popularity in Europe in the 17th century, peaking in 1636-1637 with 'Tulipmania,' a period when the price of tulips bulbs was higher than the price of a house. Thankfully the price has adjusted, and we can all enjoy the bulbs now. Leaves: The broad, strappy leaves have a waxy coating that gives them a blue-green color. There are usually 2-6 leaves per plant. Flowers: Flowers are usually cup-shaped, with 3 petals and 3 sepals. Some tulips are star-shaped, however. They have been hybridized in just about every color but blue. The base of the flower is often a darker color than the petals. Most tulips have 1 flower per stem, but there are some multi-flowered varieties. Tulips are reliably hardy in USDA Hardiness Zones 4 - 6. There are a few that can survive in Zones 7 and 8, but most need a cold winter, to bloom in successive years. Tulips can be temperamental about weather and water. Sometimes it's easier to grow them as annuals, planting a new batch every fall. It's a bit more work, but it will save you from seeing the unattractive fading foliage, and you won't be disappointed the following spring. Plant your tulip bulbs in full sun to partial shade. Too much shade will diminish blooming. Most tulips range between 6 - 24 inches (h) x 12 - 24 inches (w), but there are varieties that will grow taller and some that are shorter and stocky. Mature size also depends on the growing conditions. Tulips are early spring bloomers. You can prolong their bloom time by planting early, mid, and late spring varieties. Soil: Tulips need well-drained soil. Sandy soil amended with some organic matter is perfect. They also prefer a slightly acidic soil pH of 6.0 to 6.5. Planting Tulips: Tulips need a chilling period and are planted in the fall. Planting depth should be about 3 times the bulb's diameter; small bulbs will be about 5-6 inches deep, larger bulbs 8-10 inches. Add a handful of bulb food or bone meal at planting time and water well. If it doesn't rain, you must water the bulbs weekly until the ground freezes. Feed again, when the leaves emerge in the spring. The leaves need to be allowed to continue growing, after the petals drop, to feed the bulb. However, the flower stalks can be removed to prevent them from setting seed and stealing energy from the bulb. Once the leaves die back, they will pull easily from the soil. The bulbs prefer to be on the dry side, during summer dormancy. Feed each spring, when the leaves first appear. If you have trouble getting your tulips to come back each year, it could be because the winter is not cold enough, the summer is too wet, or something has eaten the bulbs. Whatever the reason, you may prefer to grow your tulips as annuals, replanting each fall. It's a bit more work, but you won't need holes as deep as perennialized planting. There aren't that many flowers in bloom when tulips put on their show so that they can be worked into any spot in the yard. They look best when planted in clusters, rather than lines. They make good companions for other spring bulbs, like Chionodoxa (Glory of the Snow), late daffodils, dwarf iris, and Scilla. And tulip foliage does not remain an eyesore as long as most other bulbs. Some of the cool season annuals, like snapdragons and pansies, make a nice contrast to tulips bowl shape. The blues of Forget-Me-Nots and Virginia Bluebells (Mertensia virginica) play up the bold colors of tulips. Tulips also make great cut flowers. If a deer problem prohibits you from growing tulips in your yard, you could grow them in your fenced vegetable garden and bring them indoors to enjoy. Tulips are popular with many animals, including deer, squirrels, and other rodents. In some areas, it's just not worth planting tulips in the ground. You are better off with tulips in protected containers. You can try deterrents or interplant with daffodils, but be prepared to lose a few. Here's some general help for avoiding common problems growing spring-blooming bulbs. There are 15 categories of tulips, differentiated by flower shape and bloom time. Single Early - Cup-shaped with one flower per short stem. First tulip to bloom, starting late March. Double Early - More than the usual number of petals, with a fluffy appearance. Tall (12-15") stems. It will start blooming in early April. Can be harmed by cold snaps and winds. Triumph - Cross between early and late singles. Tall (15-18") stems. Late April bloomer. Darwin Hybrid - Cross between Darwin and the Fosteriana. Tall (24") stems and very hardy. Naturalize well. Late season, blooming into May. Single Late - One bloom per stem. It is known for a wide range of colors and late season bloomers. Lily-flowered - Tall (18-24"), late-season bloomers with pointed, slightly flared petals. Fringed - Fringed or ruffled petal edges in many colors, sometimes with contrasting colors on the fringe. Late season bloomer with 12-18" stems. Viridiflora - Late season blooms on 12-24" stems with distinctive green streaks in their petals. Rembrandt - Once prized for their colorful streaks and mottling, these tulips are no longer grown commercially because the coloring was caused by a virus that spreads to other tulips. You may still see Rembrandt tulips advertised, but they are not true Rembrandt cultivars. Parrot - Named for the bud's resemblance to a parrot's beak. The flowers are large, with twisted, curling petals on tall (12-24") stems. Late season. Double Late - Also called the Peony Tulip, these tall (18-24") tulips have enough petals to rival a peony bloom. They are not particularly hardy but are nice in containers. Late season. Kaufmanniana - Also known as the water lily tulip, these early bloomers have flowers that open so wide they are almost flat. The leaves have brownish-purple mottling, and the plants are only 6-12" tall. Fosteriana - Also known as Emperor tulips, The flowers are large, often with pointed petals and available in many colors. Blooms mid-season on 8-15" plants. Griegii - A short (8-12"), early season bloomer with flared, pointed petals and wavy leaves. Brightly colored, including some bi-colors. Species or Wild Tulips - Great for perennializing, these are short (4-12") plants with lots of variety and varying bloom times.